The Brow Boutique Rejuvenator is an all natural blend of seed oils and plant extracts based on ancient formula for hair regrowth & health. *Note: If a hair follicle actually has died, it will not regrow hair. No products can make a hair follicle come back to life. The follicle however can still be alive but not growing hairs. The reasons cited below are the most common reasons for a follicle not growing a hair or growing it out thinly. Note: For health reasons, unsealed products may not be returned. This blend of oils is derived from natural herbs, plants and root extracts. It is rich in vitamins, nutrients, antioxidents, high quality fatty oils (that provide energy) and botanicals that were used by both Romans and Greeks as well as Ancient Chinese Herbalists to promote hair growth. Ancients rubbed natural plant extract oil into the brow area to rejuvenate brow hair and stimulate growth. In addition to stimulating hair growth the oil blend had numerous other benefits. It soothes irritation, acts as an antioxidant and moisturizes both skin and hair. It improves hair health. Adding moisturizer reduces brow hair brittleness. This makes brows soft healthy and more manageable. Brow hair differs from scalp hair. The root is close to the skin surface - so it's easier to reach. This means that problems affecting hair growth can be treated. If a follicle is dead, nothing can bring it back to life. However, just because a hair does not grow does not mean the follicle is dead. Use the mascara wand to gently brush The Brow Boutique Rejuvenator into the brow area. Massage the oil into the skin for several minutes. Repeat each evening. The nutrient rich oil should be in contact with the hair root when your hairs enter into a growth phase. Individuals of course vary but your body should enter into this cycle (at least) every 8 weeks. Tip: Aging lash and brow hair can start to get brittle and consequently refuse to curl (lashes) or lie flat (brows). Think of the softness of a baby’s brow and lash hair. 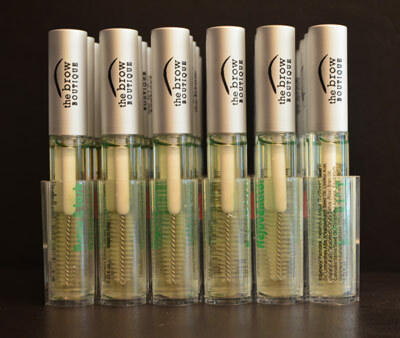 Bathing brow and lash hair in nutrient rich oil will restore moisture and rejuvenate hair. You will feel the effects immediately. Soften lashes in the evening with The Brow Boutique Rejuvenator. Use a heated lash curler in the morning and then use The Brow Boutique Styling Gel to hold lash curl in position for the day. Limnanthes Alba (Meadowfoam) Seed Oil: Meadowfoam Oil is pressed from the seeds of Meadowfoam (Limnanthes alba), a plant native to California. This oil provides energy the cells need to grow. Meadowfoam oil contains over 98% long-chain fatty acids, and also has higher quality triglyceride (the energy source that the body gets from the blood to grow the hair) levels when compared to other vegetable oils. It has amazing moisturizing and rejuvenating capabilities. When applied to the skin, it forms a moisture barrier and will assist the skin with preventing moisture loss. It adds moisture to the hair, and will remedy dry or damaged hair. Tocopherol: This is vitamin E, a fat-soluble vitamin. It is a naturally occuring antioxidant which is isolated from vegetable oil. Oryza Sativa (Rice) Bran Oil: Oryza Sativa (Rice) Bran Oil is a light yellow oil expressed from rice bran. It is a hair conditioning agent. It enhances the appearance and feel of hair, by increasing hair body, suppleness, or sheen, or by improving the texture of hair that has been damaged physically or by chemical treatment. Cannabis Sativa Seed Oil: Hemp seed oil is made from the hemp plant - Cannabis Sativa. The oil used in cosmetics and skincare products does NOT contain the psychoactive THC ingredient and is therefore not subject to any legal restriction. The profile of the essential fatty acids found in it closely resembles the skin's natural lipids, and it therefore neutralizes the effects of dehydration, and protects against a dry skin. Tocopheryl Acetate: Tocopheryl Acetate, or more commonly known as Vitamin E, is a natural preservative, anti-oxidant and moisturizer. It reduces trans-dermal water loss and helps maintain connective tissue. It is effective as a natural defense against harmful UV rays, preventing hyper-pigmentation and sun damage. Vitamin E is used in all kinds of cosmetic products and is taken as vitamin supplements for skin care, hair care and cell generation. Equisetum Giganteum Extract: Horsetail(Equisetum arvense) is a herbal plant. It has many uses and a long history of being used in medicine. Horsetail used from Ancient Romans, Greeks and Chinese herbalists recognized it’s healing abilities. While it has been used orally it has also been used as a topical remedy for hair loss. Althaea Officinalis Root Extract: This is from the root of the Marshmallow plant. It has well known antioxidant properties. It helps to minimize skin irritation and nourishes hair.